As per the cliché, after getting hit by a truck, our protagonist finds herself in a 'swords and sorcery' fantasy world. Also as per the cliché, she is granted an overpowered ability to make her new life easier. In this case, she gains the ability to summon/create anything she can imagine as long as she has a reasonable (layman's) grasp on how the thing works. Unfortunately, the world is on the verge of being overrun by the vile, undead minions of a group of necromancers. Having witnessed for herself exactly what kind of atrocities the necromancers are committing against the living (with suffering and death being powerful fuel for their foul magic) she vows to remove the taint of their existence from the world. Fortunately, she has played plenty of shooters and RTS games to have some idea of the weapons she can use against them. However, those are designed to work against living, human targets. The world is a fairly generic medieval fantasy world. The enemy skeletons are limited in armor and weapons to medieval level. I'm thinking of equipping the skeletons with sword and/or longbow and wearing up to full plate armor. Skeletons are animated dead. They are not so much dead bodies given life again as they are a conveniently arranged collection of bones whose parts are enchanted with magic to make them move again. Even if a skeleton is damaged, any separated parts will continue to move and act on their own. For example, a disembodied arm will use its hand to crawl along the floor and grab at opponents' legs. As long as any part is still able to move it will continue to try to harm the living in any way possible. A 'complete' skeleton will fight with any weapons it can find while any 'spare parts' will bite, scratch, grab and kick as able. This, unfortunately, means that it is not enough to simply remove the head or destroy the brain. Also, unfortunately, the undead remains animated even if the necromancer that raised them is killed. The sheer malice of the magic giving them life ensures they only stop when fully destroyed or rendered immobile. They are not mindless; their intelligence is at the level of an average human. Without going into the exact mechanics, there are some general limits to the protagonist's ability. Apart from having an idea of the summoned object there is also a summoning cost in terms of energy user (think 'MP'). There is only so much MP that she can generate in a given time, limitting the size, complexity and/or number of objects summoned. Essentially, anything can be prepared given enough time, but on-the-fly summoning is limited to very simple, small items. What sort of modern weapons could the protagonist use against skeletons, if the goal is to destroy them as completely as possible? How would you destroy large groups in the open? What about enemies occupying a town when you want to keep the buildings and any innocents in one piece? What about clearing them out of a building without demolishing it? Note that the skeleton enemies will be actively fighting back and they will number in the dozens to hundreds. Being in melee range of them is generally a bad idea, so unless the melee weapon is particularly effective a ranged approach is probably preferred, though ammunition is a potential concern. Note that the engagement is one against many, not army vs army. Below are my own initial ideas. Bludgeoning weapons seem the most effective option, though I wonder how much physical strength would be necessary to break enough bones to take out an undead. The use of a powered exoskeleton (i.e. power armor) could mitigate some of the danger, but engaging in melee still seems like a bad idea. Pistols and rifles of sufficient power will break bones - if they hit and don't simply pass through the gaps in the skeleton or glance off a bone. After the torso or spine is destroyed, hitting individual limbs would be a lot harder too. Either a form of saturation fire or expert reflexes and accuracy would be needed. If my understanding of explosives is correct, it's the pressure of the shockwave that kills the target through internal trauma. That means that at the very least, performance against skeletons is (much?) worse than against living humans. Useful against massed concentrations of undead. Basically, drop a mass of rocks on the enemy from as high as possible. Either artillery or aircraft drop something like the Lazy Dog bomb on the enemy. Though, like bullets, a lot of them would need to be dropped to ensure complete destruction of the target. Throwing an acid or similar onto a skeleton might be easier than filling its entire space with bullets. Chlorine trifluoride comes to mind, which reacts violently with pretty much with anything, though this would probably not be safe for the user. Edit: I should have indicated this from the start (but mistakenly opted to try for a general answer), but I'm most interested in the situation where the protagonist is forced into a situation of needing to dispatch enemies that have occupied the building she is in. (Because I'm finding it really hard to come up with good solutions for it.) However, I appreciate answers on all scales. A skeleton is in many ways a similar target to the types of barbed wire fences used in fixed defensive positions. 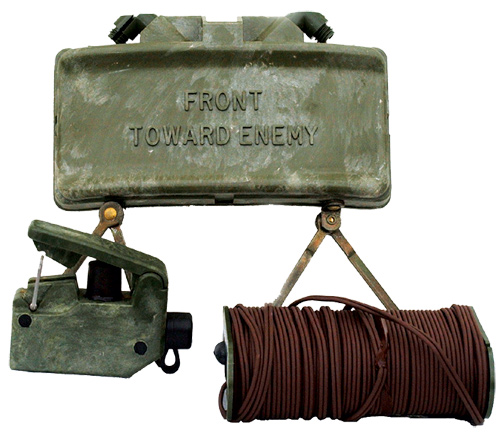 While you can pound them with artillery and mortars, the most efficient way to create breaches in a barbed wire obstacle (if you can sneak close enough without getting shot) is with a Bangalore torpedo - basically a long, thin tube of metal filled with explosive. 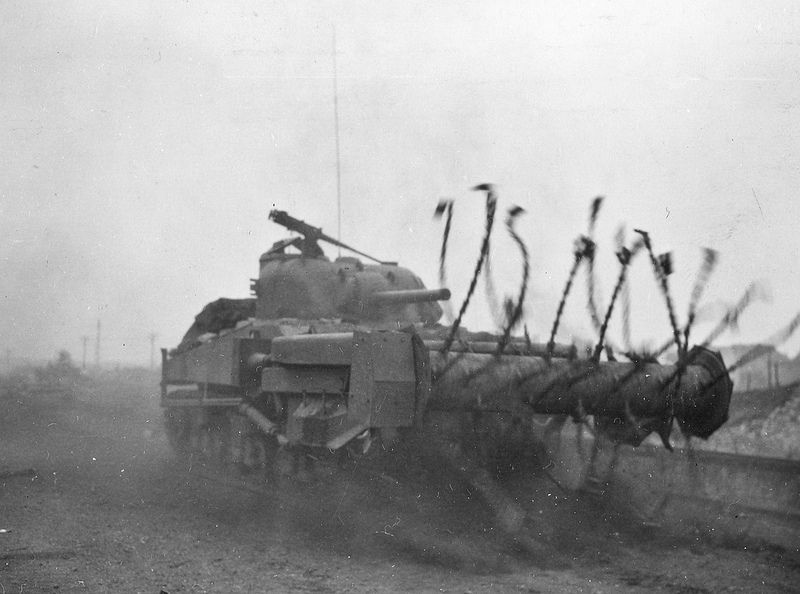 This is designed to produce long strips of shrapnel flying through the air to cut through any barbed wire in the vicinity. They would do a dandy job on animated skeletons. 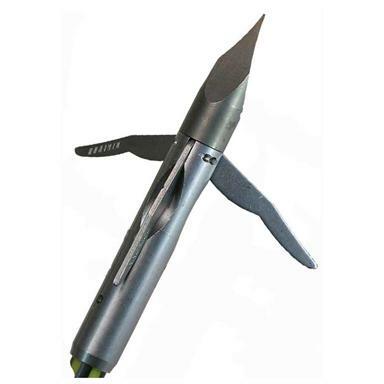 (If the protagonist cannot visualise the actual manufactured piece of kit, they are easily improvised in the field with det cord, plastic explosive and three star pickets (the same type of star pickets used to create barbed wire fences, ironically enough.) Lure as many skeletons as possible into a prepared position and initiate the charge from under cover. If the protagonist must engage directly then she must remember one thing - this is not a video game and she only has one life. Against dozens to hundreds of enemies with longbows she will get unlucky sooner or later if she gives them any chance to hit her. So she must stay out of range (up to 300m for longbows) or in effective cover always and never expose herself to the possibility of being hit with incoming arrows. In case something goes wrong, she should get a helmet and body armour. Engaging an untiring enemy that is difficult to hit effectively in a series of hit-and-run battles from over 300m away will be challenging. In order to be able to withdraw quickly while carrying significant weaponry and munitions a 4WD is definitely required. (Tracked armoured vehicles require significant training to operate safely and effectively, so they are not a feasible option.) My personal suggestion would be a HMMWV with a Mk 19 grenade launcher mounted and as much 40mm ammunition and fuel as can be carried. Whenever possible she should engage the skeletons from high ground and during periods of rain, both of which will have a significant negative effect on longbow effectiveness but will have minimal impact on the effectiveness of the grenade launcher. So that takes care of open ground tactics. As for weapons and tactics for when she is going to single-handedly take on the armies of darkness in streetfighting to rescue the innocents - she must never do that. Ever. No matter what. Because if she does she will die. If it is essential to go house-to-house then conjure up a bomb disposal robot (replacing the disruptor with a shotgun) and send that in using remote control. Or she can drive to about 300m away and fire prac rounds through the Mk 19 instead of HEDP if she can get clear shots, that way there is at least no fragmentation to kill friendlies. The following is an animation showing it at work - click to see full video. These are based on M4 Sherman tanks and still have the standard weaponry in addition to the flails. Use immobilizing foam to neutralize the skeletons and then the villagers can go in with hammers or similar and finish them off. This will be therapeutic for the villagers in that they feel they are getting to fight back and will ensure total destruction of the skeletons. To be sure once the skeletons are smashed up with hammers they should be swept up and burnt, ground in mills, or otherwise permanently neutralized. The trouble when you ask for weapons is that people think of weapons. The sound of Brrrrrt is all very well in context but we're looking at an entirely different problem here. 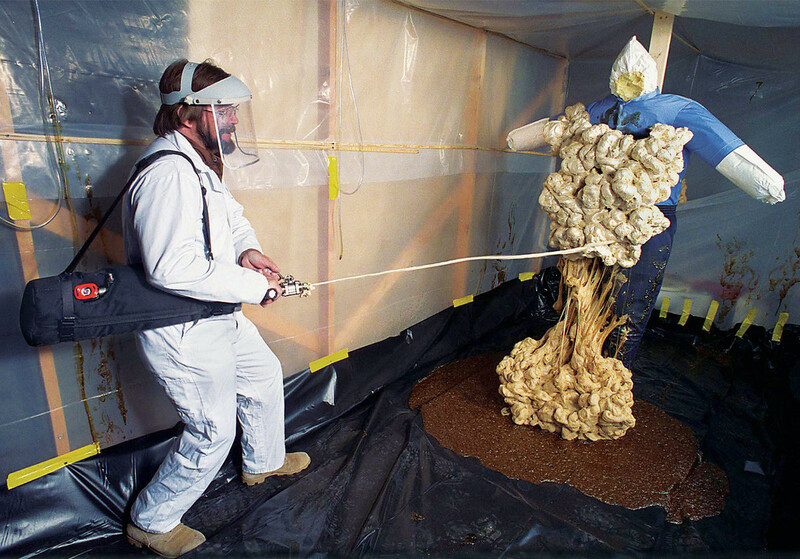 It's closer to toxic waste disposal than combat. Szczerzo has the right idea when it comes to small scale troubles and building clearances, pitchfork and a woodchipper is the way to go, but once you're in open fields you need something a little more industrial in scale. I present to you, the armoured D9R. There's nothing in medieval combat for dealing with something like this in the field. It'll stop a cavalry charge dead in its path, skeletons mindlessly attacking are merely going to turn into bonemeal under the tracks. There may be a few stray hands crawling about the field afterwards, but that's for the woodchipper squads to clear up. We here, in the Department of Skeletal Removement use pitchforks (and shovels) and wood chippers. And then load them into wood chippers. Always follow the safety rules and wear face mask. We don't want to inhale the bone flour. It itches in the throat for days. How would you destroy large groups in the open? 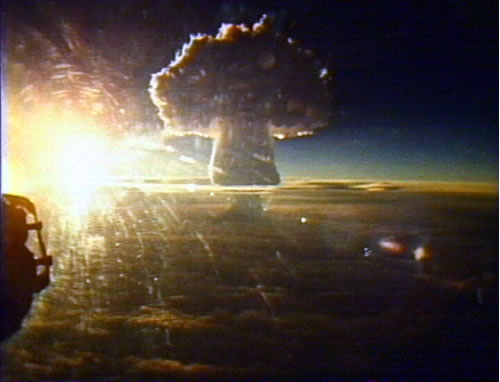 The Soviet RDS-220 hydrogen bomb, known by Western nations as Tsar Bomba, was the most powerful nuclear weapon ever created (...), it also remains the most powerful explosive ever detonated. This works best if blown up from a few kilometers above ground. Maybe summon it already up. What about enemies occupying a town when you want to keep the buildings and any innocents in one piece? You can't save everyone, you'll always have casualties. What about clearing them out of a building without demolishing it? 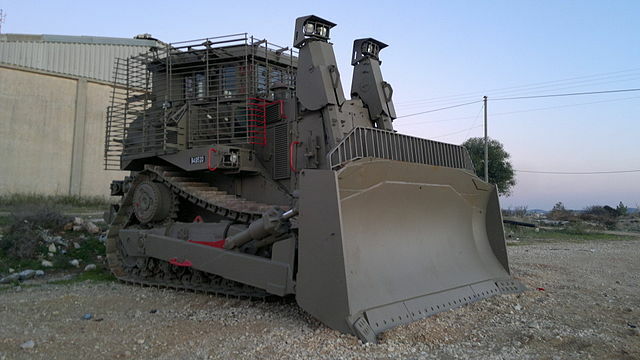 Forget military equipment, use construction equipment. 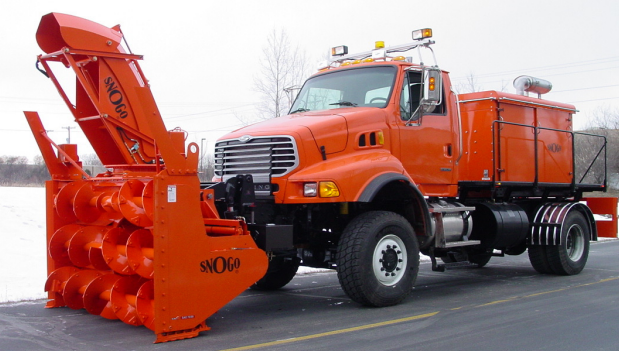 A fleet of back-hoes to dig pits, bull dozers to shove them in, Dump trucks to drop in asphalt, you have a public works project that solves your problem for both roads and armies. 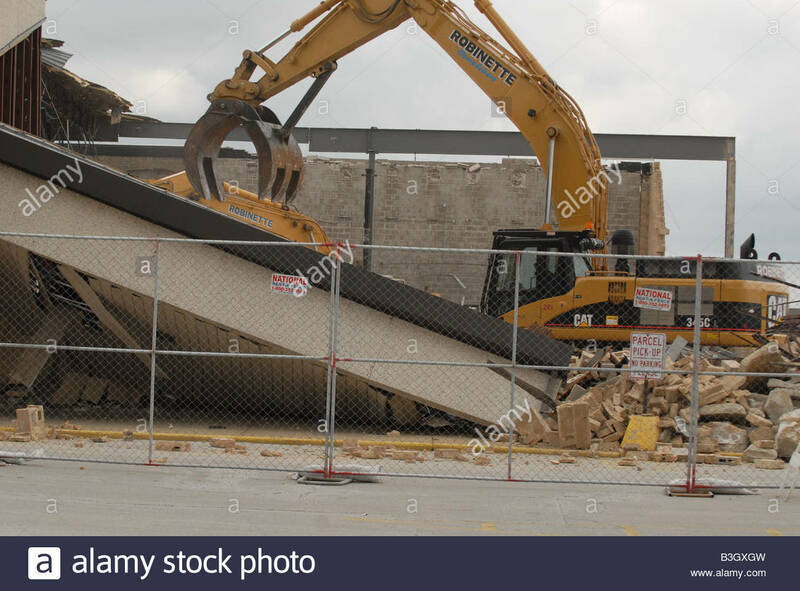 The hot asphalt dropped down after the skeletons were pushed in would stick them together, trapping them in, if any were able to make it out, the bulldozers could take care of them. Or, steamrollers could flatten them. Mace-men could handle any that slip past, or climb up onto the vehicles. Plus, it adds a bit of comic relief to what could be built up as a terrifying situation. If her powerset is a literal "summon any known object immediately", then a top-tier skeleton removal tool would be a large slab of granite, starting about 10-30 feet above the ground and eagerly awaiting the call of gravity. This should render the opposition into some appropriate level of powder. If not, the several tons of rock on top of them will leave them immobile for some time. For extremely large slab drops, we might be concerned that the downdraft of air pushed aside during the drop could sweep skeletons out from the kill zone (bad). This can be fixed by lower drop heights, and/or by perforating the rock with holes to allow air to escape upwards rather than being pushed aside. Longbows do offer some nasty sniping opportunities. Being arrowproof at all times is well within the parameters by any modern ground combat vehicle (tanks, APC, etc...). 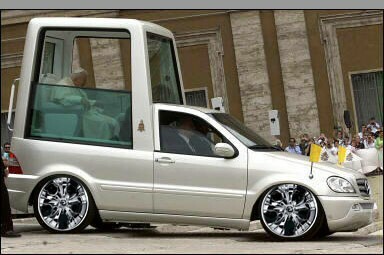 However, you might be at risk of being swarmed in your blind spots, so perhaps an all-terrain pope-mobile with judicious application of granite-drops is easier. Avoiding property damage by yourself means either getting the skeletons out of the urban environment, or turning yourself into a perfectly protected room-clearer. If the skeletons can be manipulated, blasting out a rock concert on the village green and then applying open-field tactics seems like plan A. If not, then this is not feasible by yourself. No man-sized suit of armour is safe from a sledgehammer. To say nothing of the time required to clear entire villages and towns room-by-room single handedly. Therefore I advise a political/God-queen solution. Arm some poor buggers and get them to do the dirty work. This can be as simple as riot gear and hand weapons, or as high tech as you like (I'd go simple, peasants may accidentally wreck their own town or get some assassin-y ideas if too well equipped). Extra carrots for your followers could be summoning antibiotics and working sewer systems. An extreme but effective solution could be using a megaphone to call the remaining villagers out of their town, granite-dropping the entire damn place to kill the skeletons, and then summoning a nice new town on top of the granite. First thing that comes to mind is chain shot. 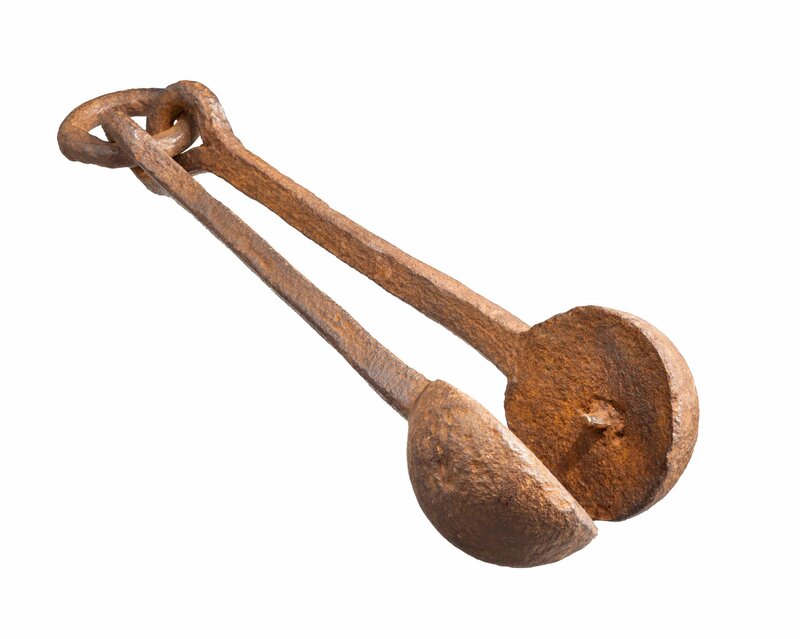 Two cannon balls joined with a length of chain. Originally used to bring down the masts of sailing ships, I imagine a volley of those through the middle of a skeleton horde would do sufficient damage that the shovel-and-cudgel brigade could then wade in for the clean-up work. These machines are GREAT at chopping lots of material into small pieces and disposing of them. They're heavy duty enough to chop through blocks of ice, a few skeletons shouldn't be a problem. They're road vehicles, giving them a higher max speed and range than most tanks or construction equipment. Perfect for catching up to the hordes or escaping them. Add a little bit of armour and you're good to go! For close range I think Tim B and Renan had the best ideas with immobilizing foam and nets, and KerrAvon2055's suggestion of the Bangalore torpedo is most likely the best option you have in terms of using explosives. I don't have much to add on that. Can you summon a vehicle? If so, a steamroller seems the easiest. Drive over them, watch the dust fly away. Otherwise I would just summon a 40mm grenade launcher or perhaps a mortar, conjure up ammo and you are good to go! A first salvo will shatter the hit skeleton and make the surrounding skeletons fall apart or to the ground. The next salvo's will make them even less dangerous. Repeat till destroyed. Mortars also have the advantage of no LOS firing. The biggest advantage is how extremely simple these things are in comparison to most other weapons. Or perhaps shotguns. Shotguns can tear bone apart, and automatic shotguns would basically function as ranged hammering on the skeleton. Given that the skeletal enemies seem to be animated as if they had muscles acting on their joints (and the bones aren't simply levitating, e.g. 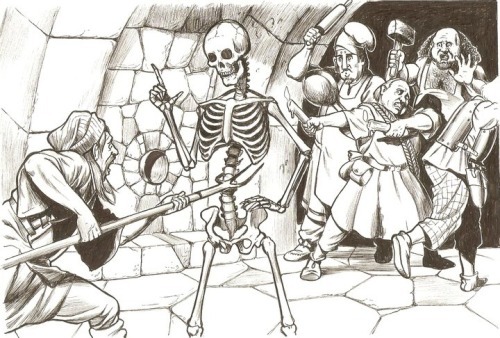 you don't need to worry about being bludgeoned by a single animated femur), then you simply need to break the skeletons into small enough pieces that they no longer have functional joints, or lack enough structural integrity to support their own weight. And although limbs can continue to function once separated from the body, they will have reduced mobility (and thus combat effectiveness) by virtue of the fact that limbs are not generally designed to ambulate entirely on their own. This means it is possible to deal crippling damage to your skeletal foes without necessarily having to completely destroy them. One ubiquitous modern weapon which might be suitable for this task without causing major collateral damage would be a large-caliber shotgun, loaded with buckshot. A buckshot shell sprays between 10 and 30 lead or steel balls in a tight cone, and would be more than capable of shredding a significant portion of a skeletal enemy at moderate range. Bird shot, which uses more pellets of smaller diameter, might also be suitable at close range. Shotguns have the advantage of being easy to use, ammunition is not difficult to produce (you don't need a high-tech industrial base), and you don't have to be a particularly good marksman to inflict significant damage to your foes with one. For large groups of skeletons where collateral damage is less of a concern, a fragmentation grenade would be more effective. This employs the same principle as the shotgun -shredding the bones with metal fragments- but on a much larger and more violent scale. It is possible to destroy the structural integrity of bones by superheating them or by applying strong acids or bases, but this probably isn't practical because these things require significant time (sometimes several hours) and, in the case of heating, copious amounts of fuel, which wouldn't typically be available in a combat setting. You might be able to pulverize them at short range using ultrasound, but again, this is likely an impractical approach. The temperature at which bone is burnt to ash is around 1600 degrees Celsius. White Phosphorus burns vigorously when exposed to air, is sticky, and burns hotter than thermite, at around 2760 degrees Celsius (5000 degrees Fahrenheit). I am fairly certain WP munitions will make short work of skeletons. I tried to look up how long it would take their bones to burnt to ash, but couldn't really find anything. Just don't use it close to you or in any building that could burn down. And don't breathe the fumes; repeated exposure is known to make your jawbone dissolve. It has been pointed out that WP burns at 5K Farenheit, not Celsius. That error means WP is only 1000 degrees above the decomposition temperature of bone, which may not be fast enough. A MIG welder requires power and a gas supply, which imposes limitations on its use. But it produces a plasma stream which ranges between 6 to 24 thousand degrees Celsius. Even with full-on welders' gear, I wouldn't want to try to fight hand-to-hand with one, but channel your inner Kevin McAllister and set up point defense booby-traps. Booby traps involving a combination of dicyanoacetylene (burns at 5000 Celsius) to be set off via conjuring some liquid oxygen from... As far away as you can get would probably be enough to get rid of your skeleton problem. They might also start an inferno that gets rid of much of the town. Basically, you can, if you look hard enough, find incendiaries we either have today, or could figure out how to make (if we needed it desperately enough) that are energetic enough to destroy a bone skeleton quickly enough to save the day. The problem is anything vigorous enough to do the job will necessarily pose an extreme fire hazard to anything flammable, specifically to wooden buildings. Even dust-grain sized droplets of burning dicyanoacetylene, or liquid oxygen, can land on tinder and there's a good chance your hero is going to have a bad day. And the skeletons will likely thrash around enough to cause such spraying. Works great in stone buildings. Wood buildings, not so much. Your best simple defensive weapon against a skeletal army may very well be good old-fashioned density. Bone is roughly twice as dense as water. Even naked, a skeleton would have no buoyancy at all and would quickly sink (armor would only make it worse). They can't reasonably move through water because without muscle and skin, they don't have a lot of surface area on their hands and feet to generate propulsion while attempting to swim. A moderate-depth moat would be an extremely effective defensive weapon against a skeletal army. Their only way across would be to walk across the bottom and climb on top of each other and out the other side. They can't attack you while underwater, and when climbing out they're extremely vulnerable to peasants wielding hammers. So summon up a big pile of shovels or a backhoe and dig you a skeleton-proof defensive line. Or summon a boat and move overseas. If you want a more complex skeleton-proof defensive weapon, summon up some doors with biometric locks. Fingerprint, retinal scan, whatever, the type doesn't matter, they don't even have any of that stuff in the first place. Without skin, they won't be able to get a lot of traction between their feet/hands and the pavement. They would be very susceptible to slippery surfaces. Build a steep ramp out of slick, polished metal that humans can climb with a struggle, and a skeleton will slide right off. Post peasants wielding a fire hose at the top for extra effectiveness/comedy. Pick them off at your leisure. If you put your skeletons in full plate armor like you suggest, then they won't be too much different than a human wearing the same armor. With a human, you'd use a high-powered compound bow, crossbow, or any modern firearm that can pierce through the armor. A human target could then bleed to death, but the best a plain arrow would do to a skeleton would be to lodge in a place where it restricted movement (less likely for a bullet). You'd need something like an exploding payload on the arrow to do any real damage, or close to melee range and use a heavy bladed weapon to sever limbs. 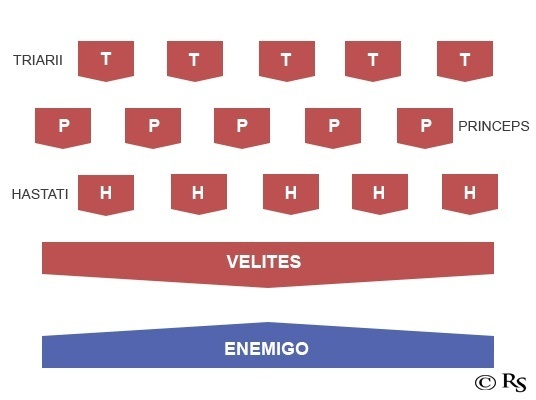 For clearing/escaping a building, most of your fighting will be in melee range. A small shield and a hacking blade (like a machete) would let let you disable an unarmored skeleton attacker fighting 1v1. A heavily-armored skeleton would be slower than you, so keep just out of its melee reach and blast it with a shotgun. Aim for shoulders and knees to prevent them from attacking or giving chase. Once disabled, disarm them and wait for the hammer-wielding cleanup squads to finish them off. Speaking of arming peasants, a scythe could be useful for taking the legs off of a skeletal attacker. Your peasants likely already know how to use it, too. At that point, the skeleton is vulnerable to hammers and has limited ability to attack. If you want to go extremely unconventional, summon up some highly-trained herd dogs. Your local peasants will already have herds of cattle, horses, buffalo, etc. Use the dogs to stampede the livestock directly towards the oncoming hordes, and watch them get ground into dust. Most ranged weapons will be worse than useless, the only thing that will be even moderately effective are RPG's AKA rocket propelled grenades, even normal grenades will be decently effective. they will fragment the skeleton. But they will really only be useful for getting away or for softening them up as a direct attack method they will leave the skeletons in relatively large pieces. 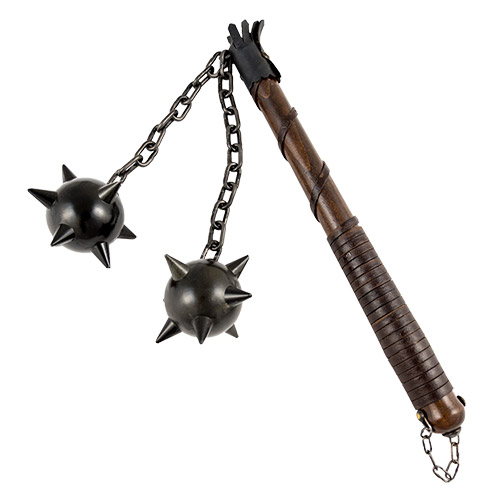 If you don't mind going old school, cannon and chain shot will also be somewhat effective. they will rip through a skeleton as if it was not there, with some creativity it might be possible to create a modern equivalent. 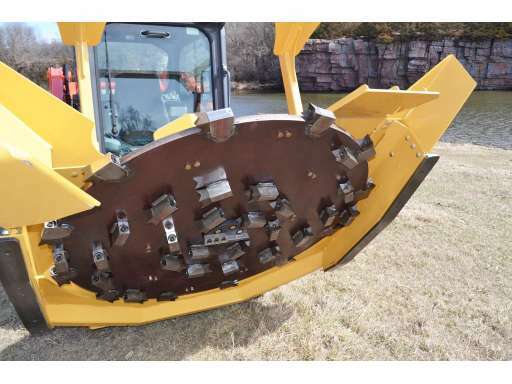 A skid steer driven mulching mower, this will not only cut the skeletons apart but you can run it back over the pile to reduce them to nothing but bone chips. The open front combined with the crash bar means you can basically just run into the skeletons. The windows are designed to withstand flying rocks and branches a bow and arrow will not penetrate. A skidsteer is also a lot more fuel efficient than a tank, althou chasly's tank is also a good idea. For close combat platemail plus a finned mace is your best bet, Once bone is removed from it protective covering of tendon and muscle it is relatively easy to smash. Honestly a baseball bat will work just as well. A pole hammer may be a nice choice as well, although you need a decent amount of room to get the best use out of it. Bolos and tripwires, will be good for knocking down the skeletons to make them easier to attack. Now if you want to get creative, your summoner could summon a Independent Tactical Thagomizer otherwise know a stegosaurus, which will be a able to smash skeletons quite effectively, they are very agile so they can strike a large area, and they are well armored even if they don't look like it. The are covered in armor, skeletons will have a hard time injuring them. 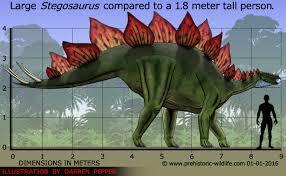 An ankylosaur will also work. Of course if you want effective and fun, you can use go the monster truck route, the fuel efficiency is about the same as tank but one person can drive it, and many run off alcohol so they may even be able to get local fuel. Plus you get to have your character giggling like a lunatics while tearing around the army. A demolition crane would give you the relative safety of not engaging the skeletons in close combat and the tool to crush many bones in one simple move. The disadvantage is than the crane cannot move very fast (although it's not very slow either), so she needs help against big groups. Helpers with pitchforks, nets or Tim B's proposed foam guns can keep the enemies away from the crane while it crushes one after the other in quick succession. If (like the question suggests) the protagonist understands enough about A.I. and robotics, I would conjure up some terminators (T800; the liquid metal of the T1000 and such is most likely something the protagonist does not understand, mostly because I doubt it is possible). Terminators are robust enough to take a beating and more than strong enough to pull two bones apart (no need to break the bones; a single bone cannot do anything on its own, it needs to be joined to another to actually do things) even without weapons. Arm them with melee weapons and the terminators become even more destructive. As for putting the terminators to work, they can go into buildings to clear them, run around the fields to attack large groups of skeletons, basically anything a human can - just much better. And if defeated, you know they'll be back. Added advantage: once the skeletons are taken care of, the protagonist won't have to explain where she got that strange magic device she used to take care of the enemy, because she simply got help from an army from across the mountains (or sea, or whatever you want). Sure they look a bit strange, but they look human enough not to cause suspicion in the aftermath. Unconjure them (or keep a few and rule the lands) and you're done. Just spray a wide area with very small drops of burnable fluid, like fog, and ignite it. The shockwave will seperate every single bone. You don't need weapons, you just need a jail. If they're animated bones, they aren't very smart. Trap a bunch of them in a pit they can't climb out of (even on top of each other) or dig out of. You can line and cover the pit with metal bars if desired. Or lure bunches of them into a building (or a large room) they can't dismantle or get out of. Built of stone (or concrete if available), no windows. A door of iron or at least some bars that will hold them long enough to brick them in. Make sure any cage or door of iron bars doesn't allow enough room for the skeletons to dismantle an arm or leg and send it through. You can also build chutes or walls that you might imagine could be used to herd cattle. They can herd the skeletons into their traps. Once they're all (or mostly) contained, you can come up with creative ways to destroy them. You can even experiment to find the best methods since, if it doesn't work, you'll only have one group to recapture. Fire, acid, crushing, all the ideas given in other answers. Vats of acid? Flail tanks? Tsar Bomba? We are 8 people hiding out in a chicken farm! Where are we going to get all that? made out of XL sized Molly bolts. Here is the thing about skeletons. You don't want to bust them up. An animated skeleton is like a bag of dung. You don't like it, but you like it better in the bag. You don't want a bunch of loose skeleton parts scuttling about, working their way into your clothes when you are trying to make dinner. Keep all of them in the skeleton. 1: Molly bolt arrows are on a cord. 2: Shoot Molly bolt arrow at skeleton. Aim for ribs. 3: Molly bolt closes on the way thru and opens on the far side. Skeleton is now on a cord. 4: Your helper pulls on the cord. The cord is pretty long. It goes up and over something high before coming back to your arrow. Skeleton is pulled sideways to collection point. 5: Hoist skeleton off its feet. It will wiggle. 6: Tie down rope. Repeat. 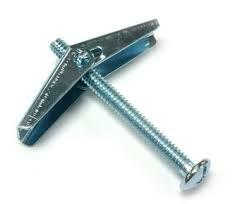 Alternatively, attach cord to arrows using eye bolts. Many arrows will be on the same rope. Many skeletons will wind up on one cord. It will be more convenient to move them around this way. Plus they will get tangled in each other when at close proximity. You now have a collection of skeletons hanging from something. You could store them in a shed in case you need them later (idea taken from Walking Dead). You could lower them into a hole and set them on fire. You could whack them like piñatas. Or all three! There is an interesting article with a lot of numbers about resonant frequency and disrupting human bones and tissues. Which should mean that you're less likely to accidentally kill fleshies when trying to attack skeletons. Large, dense, heavy object summoned above them. A thick sheet or boulder of lead might work. For pinpoint accuracy, orbital satellite lasers should do the job nicely. For large scale destruction using bombs would be effective but it wouldn't completely destroy any skeletons they hit so i would suggest attempting to capture them and then either powder-rising them with a car compactor, something of that ilk or chucking them into an incinerator therefor completely destroying them which is what you want to do. for smaller spaces like a town... create a small ramming device that can be held that transmits a force into a target it is in contact with pulverising it. other than that, high velocity spinning blades that pulverise anything they touch, or just break it it don't mater, the objective is to destroy not injure until dead like a human. If they ever get a hold of you, you're done; they can basically pull a Neo (from The Matrix): sliver themselves inside you and blow you apart from the inside out. So the only solution is to keep them at bay as best you can. Ideally inside a building that you can then bring down on top of them, serving as final resting place unless you go digging. See, Army of Darkness (they couldn't reanimate) and Chernobyl (encased in concrete). Step 1: aquire first simple weapon to be on the safe side. I'd use some sort of mace or baton. Step 5: add the core to a little mountain of synthetic muscle fiber. If you bind three together, they can be controlled to curl in every directing desired. It might need little cores along the way to regulate the contractions according to will. Step 7: cover it with some sort of shock absorbing and chemical stable jelly. Step 8: insert bladder and start programming. The outcome should be something like a slimy springy glob of goo. A synthetic muscle slime golem. It could roll and reach narrow places. By steering the outer ends of the fibers to be soft, it would make very little sound, when rolling or falling. If you let the fibers contract, it should be easily able to lodge in small crevices on walls. There should be no problems with stealth and infiltration. When it engages a skeleton, it can stop incoming blunt weapons by absorbing the force. Slash and pierce damage could be minimised by wedging blades and arrows between the coated fibers. It Could attack by jumping on the target then covering it completely and mashing it with the dissolvent. It could be used as exoskeleton, too. This includes weapons and tools that could semi-realistically be built with modern technology even if in practice the expense/complexity would be unfeasible. I'm most interested in the situation where the protagonist is forced into a situation of needing to dispatch enemies that have occupied the building she is in. 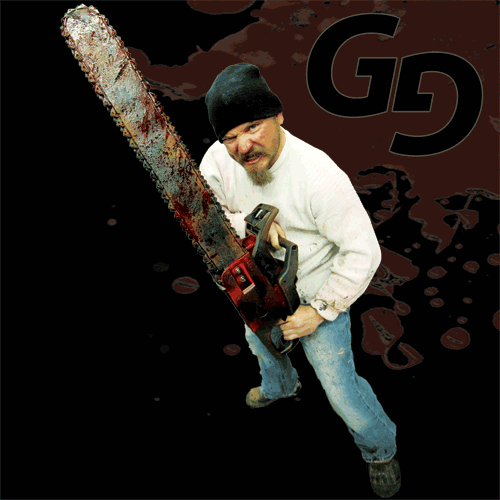 Then let's see... how about something like a swarm of chainsaws mounted on a mobile rack with the protagonist in the center? It's impossible to get close without being thoroughly disintegrated. If protection against arrows is needed, add an armored cabin in the center. Since it's not required for our protagonist to actually understand in great details the inner workings of such a device, she can imagine it as being infinitely powered by unobtanium, thus eliminating fuel problem. The whole device can be made imagined small enough to traverse buildings. First lay down industrial strength vermin adhesive paper around the perimeter in a barrier meters wide to stop the crawling bone fragments. Then set up layer after layer of claymore mines covering each side of your perimeter. 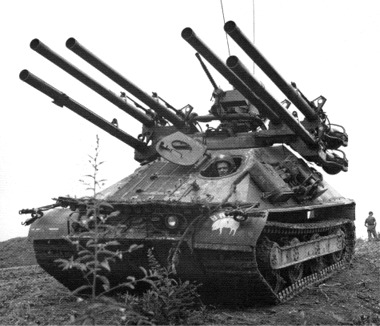 Then set up four Ontos vehicles armed with 6 106mm recoilless rifles each, loaded with beehive rounds. Then have snow shovels and acid barrels to dissolve any skeleton fragments that get through. "Let's whip it baby, let's whip it right, Let's whip it baby, whip it all night." while they reload the Ontoses, set up more claymores, and shovel skeleton fragments into the acid barrels. Simplicity at it's best, right?? Bludgeoning weapons and basically any high-powered explosives. Sledgehammers should be pretty good at breaking the bones, and enough TNT can reduce skeletons to piles of white powder in seconds. Slow, but very effective against arrow fire. You can 'easilly' create the equipment, compared to 'tanks' and other methods. 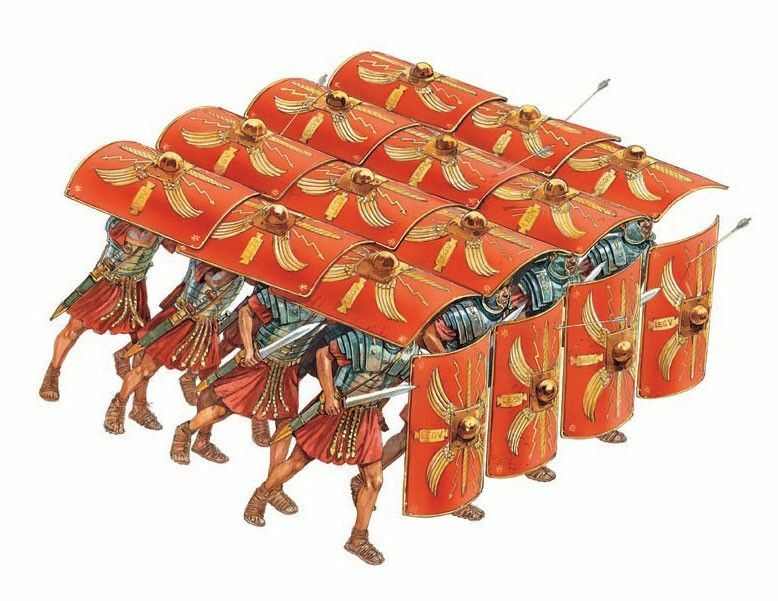 Once the enemy has spend all their arrows, you could send in your reserve forces, as these legionaries / auxilliaries are most likely spend, during their first fight. But I'd replace all the units with regular soldiers, with warhammers, and atleast some kind of a checkboard formation, keeping your most experienced soldiers in reserve. Perhaps even train cavalry, and equip them with light armour & a morning star. It'll be enough to shatter skulls. I'd keep your magic in reserve, and if it the story allows it'd create scrolls of healing, or scrolls of protection to protect / heal your units. Perhaps an last ditch effort, incase stuff goes south, some kind of protected car? Not the answer you're looking for? Browse other questions tagged science-based magic technology weapons combat or ask your own question. How could you create a 95% effective global emergency broadcasting system? How could Golems best be used to defend a modern day city of Prague? Is it possible for a skelecopter to fly? In a multiverse war, are these armies evenly matched? Justifying limited use of arrows, while allowing them to be effective in short ranges? Why would giant mechs use melee weapons? How would a high fantasy medieval society react to an apocalypse caused by magic? How do i make skeletons formidable hand to hand fighters?